Martin and Rachel have flights booked out of Cape Town to Johannesburg, where they plan to go on safari to Kruger National Park, so it was time for them to start heading westwards once again, and after a last night in a lovely waterfront apartment in Knysna, we drove to Plettenberg Bay for a quick look around, and then they dropped me off on the main highway, where we said our goodbyes. My plan was to try to hitch to Bloukrans Bridge, about 50 kilometres further east. I was stood there for about half an hour, when I got the offer of paying for a ride in a shared minibus taxi. It was cheap enough, so I was on my way, and soon booked into the hostel just by the bridge. 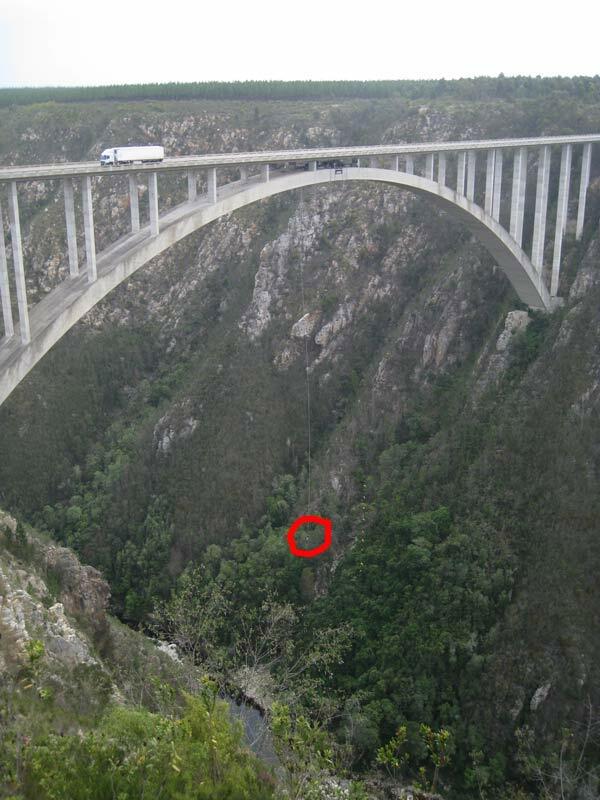 Bloukrans Bridge is the highest single span concrete arch bridge in the world, and with a maximum height of 216 metres above the stream far below, it is very impressive. At the bridge, Face Adrenalin runs the world’s highest bridge bungy jump, even bigger than the Pont de l’Arluby in France, which I jumped off in 2008, achieving my second goal. The French jump is the third-highest bridge bungy at 182 metres. It is a very slick, professional setup, with a fantastic viewpoint. There is even a pub overlooking the jump, with a live video feed too. The hostel is also only metres away, and I was the only person booked in at first, and was left with the place completely to myself for the afternoon and evening. I took a wander out onto the bridge in the evening after the bungy jump shut down – it really is knee-tremblingly high! Yes, there is a jumper in the picture below!! See if you can spot him. If not, click here for a picture with the jumper circled. Later in the evening a young German couple, Sandor and Melanie, joined me at the hostel, and the three of us had a quiet evening in the otherwise empty hostel. In the morning I hummed and hah’ed about jumping, as it’s pretty expensive, although quite a bit cheaper than the French jump had been. But in the end, I decided that I may never be back this way, and after all, it is the biggest bridge bungy in the world!! Nobody is allowed to take cameras out onto the bridge at all, but out on the bridge I had a quiet chat with Clive, whose wife runs the hostel, and he sent me back to get my camera and glove, which is very secure when all fastened up. The jump itself is fantastic, with about four seconds of freefall before the elastic starts to stretch, and as I jumped, I counted and did a practice parachute pull, as if it was a BASE jump – maybe one day, I don’t know!! One of the jump operators spotted me do it, and as he collected me at the bottom of the elastic, he asked if I was a skydiver. After the jump I also bought their DVD footage, but the video here is just from my camera, as I have no way to get their stuff onto my little computer at the moment. I will probably re-edit the video later when I manage to do so. Goal 2 achieved again!! Awesome!! Previous Post Goal 72 – riding a real ostrich this time! Next Post Lucky meetings.